Through a series of interviews this past spring I determined conclusively that girls love bubbles. Of the 42 female college students I surveyed so far not one has expressed a dissenting view. Even though I already proved it, for your own sake I dare you to find one that doesn't. You won't, because the affection between girls and bubbles is a scientific fact. Hence bubble baths, bubble tea, and bubble dances where ladies get all crazy and dance around in foam. You see, this is behavior they would never engage in ordinarily, but the bubbles compel them. The bubbles. This brings me to the separate observation that almost all of the women I know in the physics/astronomy field fall on the astronomy side of the divide (it goes without saying that there are many important female physicists, I am just speaking in terms of personal, completely anecdotal, numbers). And representation of women in astrophysics is, I have read, closer to parity than in physics overall. This is interesting to me because as anyone in those fields could tell you, there is not a significant difference in the sort of preparation involved in astronomy, or the work itself. Despite public (mis)perception, astronomy is just as math-intensive and experimentally rigorous as straight-up physics. Besides observation vs experiment, really the only difference is that the optical astronomers happen to produce pretty pictures. And I would never insult the intelligence of women by presuming that they require the lure of visual beauty, rather than intellectual challenge, to arouse an interest in science. Nor would I suspect that women going into physics/astronomy undecided would be under the same misapprehension about the nature of the field (that it is "softer" somehow) as the general population, nor that it would make any difference to them if they were! No, the real reason that female physicists choose astronomy is that they love bubbles. Now lets take a brief pause to think about what a genius I am for figuring this out. For you see, nearly everything in astrophysics is somehow an extension of the principal of hydrostatic equilibrium -- the balance between gravitational collapse and the outward pressure. 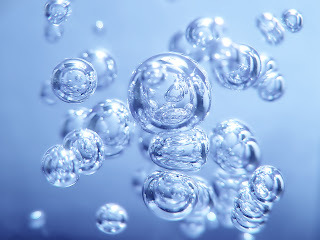 And as I'm sure you've guessed, the bubble is purest example of this found in nature (not the gravity part, the balancing inner and outer pressure). For stars, accretion disks, structure formation, nebulae, et cetera the H.E. condition basically determines everything you would want to know. Not only are these phenomena similar to bubbles in this sense, but perhaps more importantly there are actual bubbles in astronomy. Sure, there may be a few bubble topics in other sciences: chemistry, fluid dynamics, lava flows in geology, but astronomy subjects far outnumber them. Coronal ejection bubbles, bubbles in proto-stellar nebulae, magnetic space bubbles, structure formation bubbles, iron bubbles in supernova remnants. in inflationary models there are phase-transition bubbles and bubble nucleation. 'Hubble' sounds like 'bubble'. And there are whole books about astronomical bubbles in general. In fact, the largest structures in the universe (see above diagram) seem to be galaxies arranged on the surface of unfathomably large bubbles like some sort of cosmic foam. which, I suppose, is the only similarity between the big bang and one of those soap machines at a frat party. The career choice is not a matter of difference in cultural expectations or inherent abilities, it is a matter of inherent attraction to bubbles. How can women, with this predisposition written into their very X chromosomes read an article such as "Earth surrounded by giant fizzy bubbles" and not want to go into astronomy? Women love bubbles. There are bubbles in astronomy. Therefore, women love astronomy. Quad erat demonstratum. when i read the first paragraph, my initial reaction was obstinate refusal. then i was like, "wait... i DO love bubbles... dammit." ok since you linked to this page in one of your recent posts i just have to once again emphasize how brilliant this is and how much it cracks me up each time i read it.